I have a little festive giveaway to share with you today! The lovely girls at It’s a Creative World asked me to whip up a little something for them again and this is what I came up with. I fully admit this was inspired by my own leave-everything-to-the-last-minute-oh-my-word-I-need-some-teacher’s-presents-NOW way of preparing for Christmas! 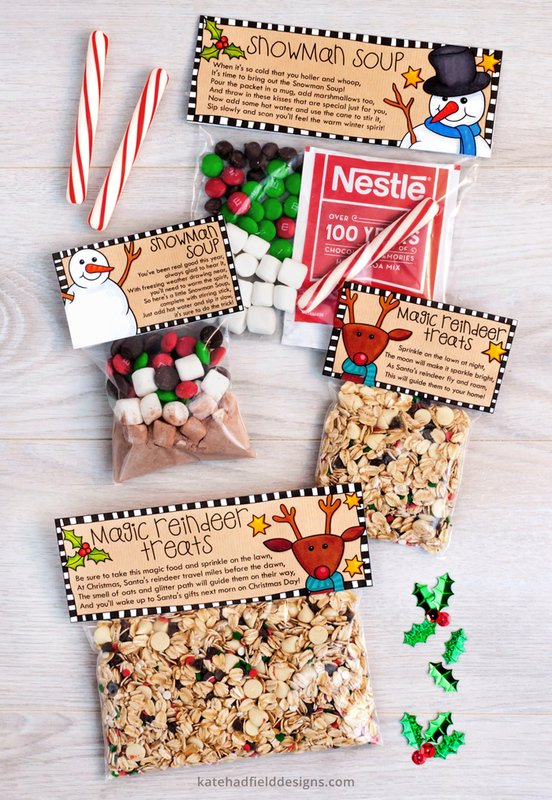 These fun toppers are really easy to use – just print, cut out and fold over the top of a bag full of your chosen treats. 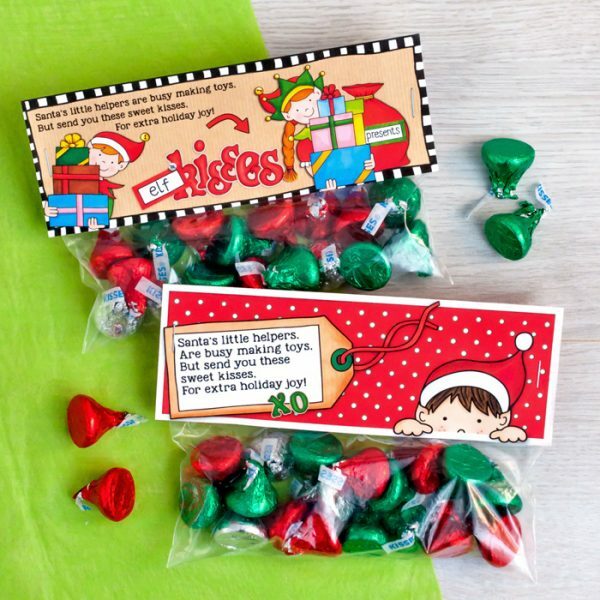 You can use tape to seal them, but I prefer to use small staples to attach the toppers to the bag and keep the treats tucked away safely inside! 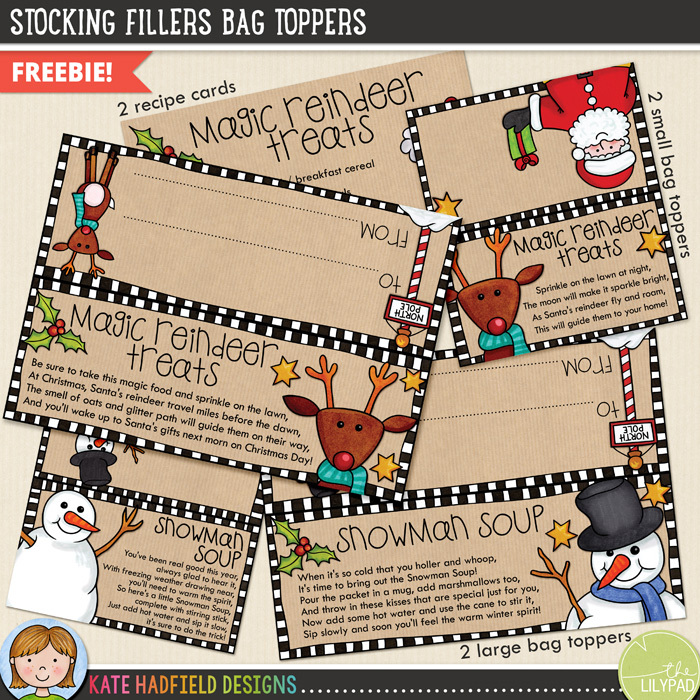 I’ve included versions with text for you to create little bags of Magic Reindeer Treats and Snowman Soup, or you could use the text-free versions to create your own Christmas toppers for whatever treats you want to give! You can add your own text to the blank versions in Photoshop or any image editing program before your print, or you can add text after printing either by writing directly on the toppers or adding stickers or stamps! I’ve also included some outline versions of the toppers (versions with and without text are included) so your little ones can colour them in themselves! 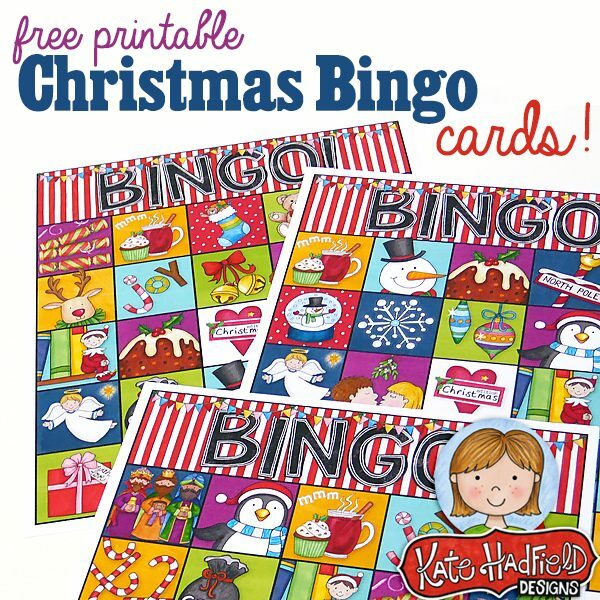 Or you could print them on coloured paper (a festive red or green would work really well!) for a really quick and easy way to whip up lots of toppers. 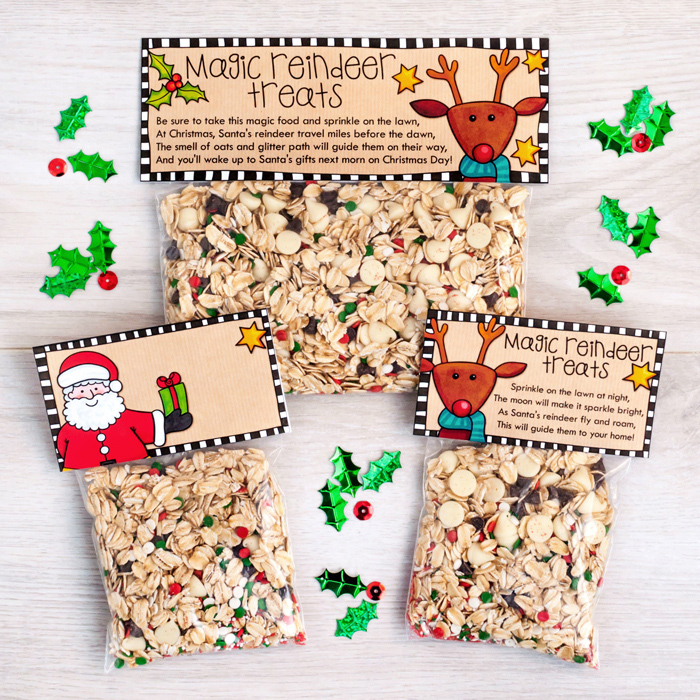 The download contains 4 bag toppers (2 big – approx 7 inches, 2 small – approx 4 inches) and 2 recipe cards. I thought they would make fun little bag toppers for party favours or end-of-term class gifts for teachers and friends. If you use them, I’d love to see the finished result so please feel free to get in touch and show off your creations! There are a couple of download options for the toppers, either a ZIP file including jpg versions of each design (so you can easily resize them in Photoshop if you need to, or if you want to add text!) or a ready-to-print letter sized PDF file. Thank you so much! you’ve saved my life!! Thank you so much! These are just lovely! Thank you !! Super cute and saved me so much time. For my daughter’s first grade class. Merry Christmas! Merry Christmas and thank you so much! These were so adorable for a quick gift for my coworkers! These are beyond adorable Kate, thank you sooo much for sharing!!! 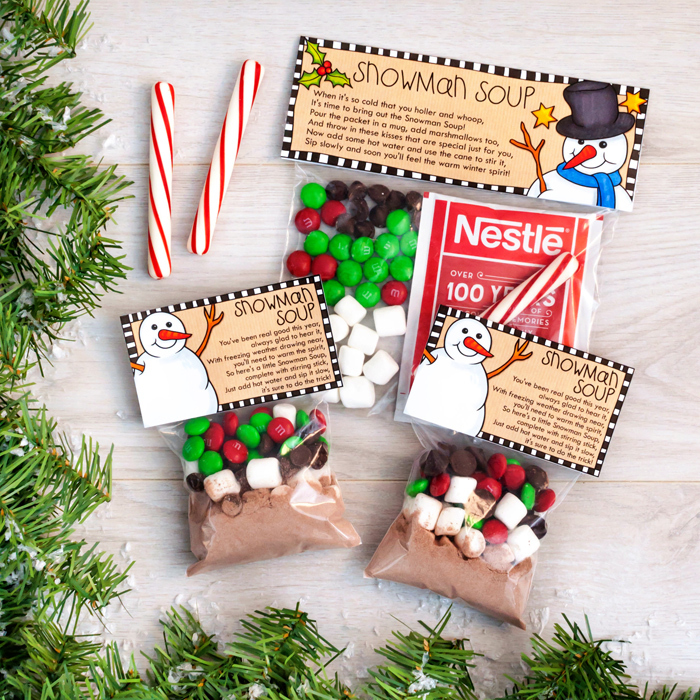 We hosted a winter baby shower this last weekend and your snowman soup (big printout) was a HUGE hit 🙂 Also saving the extra printables for cute teacher gifts this year. Thanks again!!! I am glad you like them! Thanks for letting me know you used them, I hope the teachers enjoy their gifts too! thank you for this 🙂 will use them for my daughter’s classmates this holiday! Thank you so much for sharing! So cute and fit perfectly on my ziplocks!! What a sweetie you are for sharing 🙂 Marry Christmas! Thank you for sharing your creativity and hard work! it will be a special gift for my second graders and my granddaughters! THANK YOU! I’m hoping I can close lunch bags that I’m converting to gift bags with these. Really, really cute! These are totally adorable. I’m going to make with my teenagers this weekend for their younger cousins. I would love to edit the text. (The font is gorgeous). Do you have an AI file or can you tell me what the font is so I can print on the blank ones? Thank you so much for posting as a freebie. Inspiring a newbie crafter! Hi Liz! The main font (titles and the hand written style text) is MTFplaytime: http://misstiina.com/fonts/mtf-playtime/, the typewriter font is Typewriter Old Style: http://www.dafont.com/typewriter-oldstyle.font Both fonts are free for personal use! Thank you – this is the second year we have used these to raise money for our school. in 2012 we sold many more reindeer foods than we had ever sold. Many thanks for your kindness. Wish you a merry christmas and a happy 2014. Oh that’s great!! I hope you sell loads more this year too! Thank you very much. These are adorable. Thank you for you generosity… my residents will love them! They are adorable and thank you for your generosity. What kind of paper do you use to print them off on? These are really cute! Thank you so much for sharing your artwork and designs. i just want to say how much i love these!!!!!!!!!!!!! i printed off both, and it was cheap and just awesome….i used regular sandwich baggies, and just folded them in half and then stapled the topper, and they are so colorful and bright…. thanks again…. I’m glad you like them Irene! Thanks for stopping by! 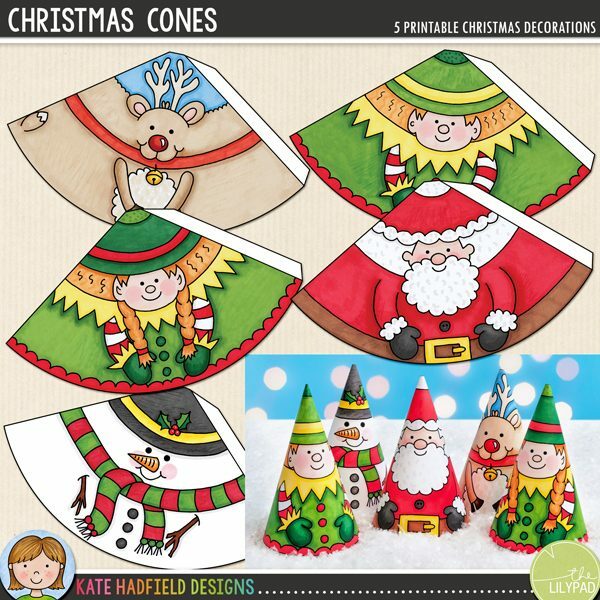 These are so adorable, have pinned them as they’re too cute not to share! Really brilliant designs, thank you! These are wonderful! Do you make these for the kiddos or with them? You could do either! Maybe get a little production line going with the kids filling the bags or folding the toppers! Thank you! The kids are going to love these!! Thank you for doing this! They are so cute. Thank you!! I was able to print them!! Thanks you. That’s so adorable, and just what I’m going to need for a few things! Thank you sooo much, I love them and will use them this year for my nieces and nephews. I love your blog and will be back to visit often. Hi Jackie, please try printing the PDF versions if you are having problems with the jpegs! I added PDF versions to the zip file a couple of days ago so you may need to download them again to get the PDF versions. Please let me know if you are still having problems! I was wondering how to print these out myself….they are adorable!!!!!!! I’ve just updated the zip files with some PDF versions of each of the designs so if you are struggling to print the jpegs please download the file again and give the PDFs a try! Please let me know if you have any problems with the PDF version. Hi. What size bags do these work with? They are so cute. The toppers are sized at 7 inches wide for the large one, and 4 inches wide for the small one and so would work well with bags of the same size or a little smaller. I found a link to these on ishareprintables.com. Thanks so much for sharing! These are SO cute. Thank you for sharing. Love them!! Thank you so much – they’re adorable! What a wonderful idea for my grandchildren. Thank you so much.! Have a happy and safe holiday everyone. Love your work! Stumbled upon your blog via Pinterest–you’ve created some great stuff! Thanks so much for the freebies. I love your reindeer food tags. I’ve been looking for something like these for awhile now. I’ve downloaded them and when I print them the wording comes out reversed. The preview for the print shows the words the right way but when it prints it’s reversed. Any idea what I’m doing wrong? Hi Lisa, I am so sorry you are having problems printing these! Please shoot me an email to katehadfielddesigns@gmail.com (or use the contact form on the blog here) and I’ll see if I can help you work out what the problem is! Beautiful!!! I’ve seen variations of these, but yours are exquisite! Hi Deanne, I’m sorry to hear you are having problems! If you click on the links in the post the files should automatically download, then you just need to extract the files from the zip. Let me know which part you are having problems with and I shall do my best to help! Tried to print the bag toppers but the site said not valid. Is it because it is si late? I was able to get this website. I really loved them. super super cute! thanks Kate! Thank you so much they are so CUTE! Thank you for the awesome gift and will post when I get them made and posted. 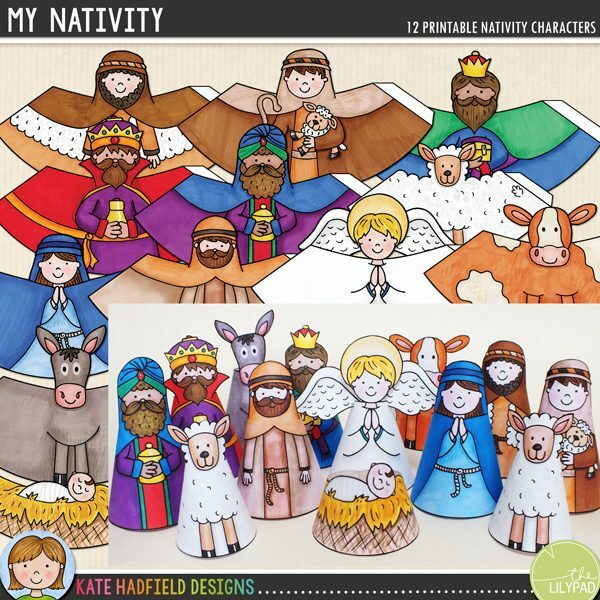 Thank you Katie, these are lovely and just what I needed to make the children’s cards in my family! See my most recent post. Have a great Christmas! These are wonderful! Perfect timing because I need something just like these this week! Thanks! Thank you Katie, I love them! Happy Holidays to you and your family. I loved these the first time you gave them to us and now a new set! Your just too sweet. I just printed them out for my grandson to bring to school for his teachers. We did them last year too so different teachers this year! Thanks so much for sharing your wonderful talent! That was really nice of you:) It will be perfect!! They are so cute ! Thank you soooooo much !! Absolutely P E R F E C T! Thanks ya Miss Kate! Happy Holidays to you and yours! Thank you! These are very cute! thank you i love your stuff and so does my kids :)!! Thank you so much for the super cute toppers! THEY’RE SO CUTE!!! You are an absolute darling.